A king has his castle, a child yearns for his own room, an infant is placed in a crib or playpen for safekeeping. Don’t our young canine friends deserve the very same consideration for their well-being when we are gone? Training crates for dogs are too often deemed cruel. In fact, they are both training and safety devices and as such can benefit dog and owner alike. Crating on a humane schedule teaches puppies bladder and bowel control and limits teething to his/her own property. 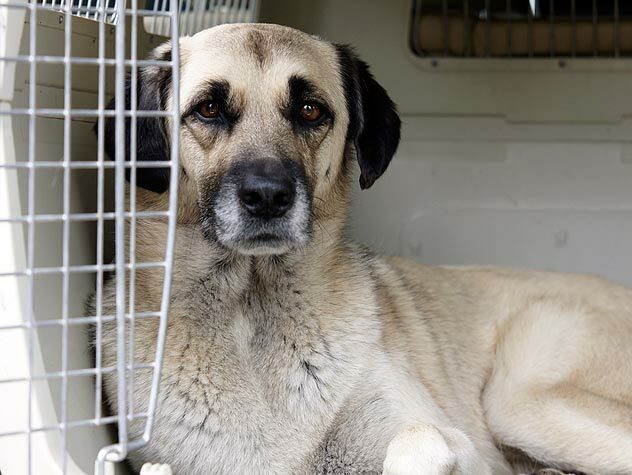 A dog crated in a car has a better chance of surviving an auto accident and little chance of causing one. Dog crates come in all sizes, many colors, and different styles. The most common are molded-plastic airline shipping crates and the open-wire types that usually come with a metal tray on the bottom. For owners who plan to do a lot of air travel with their dogs or for those whose dogs prefer dark, cozy places, the molded-plastic variety is best. Wire crates are preferred in most other instances. The size of the crate is based on the size of your dog. There should be enough room for him to stand up, turn around in a small circle, and lie down comfortably. The crate serves as a place where the dog can rest and chew on safe, appropriate toys. It is not an exercise pen. If you plan to use the crate as a housebreaking aid, size is of paramount importance. If there is room for Rex to soil and then lie high and dry away from the mess, the crate cannot serve its purpose. Those buying crates for puppies should keep the adult dog’s size in mind; but until the pup grows up, excess room should be cordoned off in some manner. Masonite, Plexiglas, or even old wire refrigerator shelves can serve as barriers. How long can a dog be crated in one session? The rule of thumb for crating is no longer than one hour per each month of age, up to nine to ten hours maximum (the average work day). Each session should be preceded and succeeded by an hour of aerobic exercise. If this is too long for your dog, hire a dog walker to exercise him midday. Before you can leave your dog for the long stretch, make sure you have accustomed him to the crate. A dog who panics when left alone in a crate could do damage to the crate and, more seriously, to himself. And never, never crate your dog while he is wearing any sort of correction collar—it could easily get caught on something in the crate and choke the animal. Young puppies need lots of human stimulus and feedback, so avoid relying too heavily on the crate in the early months. Most puppies three and a half to four months old can be crated overnight for about six hours, even though they probably cannot yet display that kind of bladder control during the daytime. Younger dogs crated at bedtime will need to be brought to their papers or outdoors at least once in the middle of the night. a curious adolescent at liberty in your house. Your dog may behave perfectly for a few weeks and then one day you might come home to find the place in a shambles. A crate can provide peace of mind for both you and your dog. Think of it as a leash with walls. After all, both pieces of equipment serve to protect your dog from his own base instincts and errors in judgment. By crating your dog during the workday, you ensure him a royal welcome on your arrival home. Learn about the positive effects in crate training your dog.